This blog post was originally published on the Action for Better Healthcare site on Jan 6, 2010 (http://actionforbetterhealthcare.com/?p=250). It warned that policies directed toward stemming readmissions would harm the poor. Not surprisingly, it proved to be prophetic, as demonstrated by data from a recent article by Joynt and Jha, which is inserted at the end of this post. There is justifiable concern about readmissions. According to MedPAC, 18% of hospitalizations among Medicare beneficiaries resulted in readmission within 30 days, accounting for $15 billion in spending. MedPAC concluded that, simply based on their relationship to an earlier admission, 84% were potentially preventable. The current bills give the Secretary enormous discretion in the choice of methods and measures – no administrative or judicial review would be permitted, although the Senate bill calls for the use of the same methods now used by CMS. The problem is that CMS finds much greater variation in readmission rates among the nation’s approximately 4,000 hospitals than is found when epidemiologically-sound risk adjustment is made. For example, while CMS found that 14% of hospitals had readmission rates for congestive heart failure that were 2% or more beyond the median, only 3% of hospitals had rates beyond this range when epidemiologically-sound methods. Factors that are recognized as affecting readmissions include older age, multiple comorbidities and mental health conditions. But the strongest, yet least frequently measured, is income. More than 20 years ago, Starfield and colleagues found that admissions and readmissions among asthma patients in Maryland were principally associated with poverty. A decade later, Ricketts found the same for all readmissions in North Carolina. In a careful series of studies, Billings found “an extraordinarily strong association” between admission rates and patients’ ZIP code incomes in New York, Miami and other cities, with rates four times higher in low-income areas than in affluent ones, an observation that we confirmed in Milwaukee. Income explained more than 80% of the variation among ZIP codes. And this is not unique to the US. Across Canada, hospitalization rates for treatable conditions were twice as high in low-income neighborhoods. Poverty matters. No! Stop that blather. We have to find ways to pay for health care reform and to rein in all of those greedy hospitals and specialists who are causing America’s health care costs to soar. It’s ok to penalize the providers who care for the poor. More of their patients will be insured anyway…… But wait. If poverty is the central problem, maybe we could focus on that, and if we did, maybe we could produce better health and a more affordable health care system. Now that would really be reform. 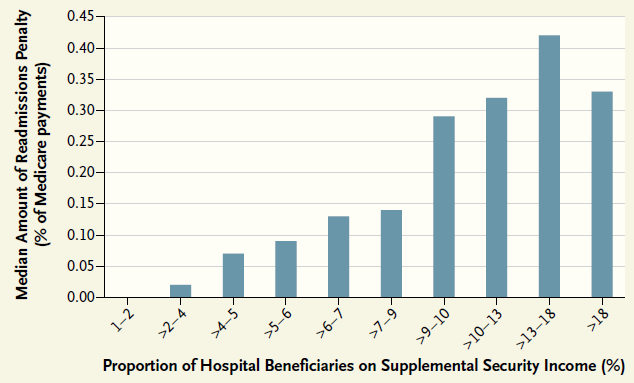 ***********************************************************************The figure that follows, which was taken by a recent paper in the NEJM by Joynt and Jha, shows how the readmission penalties that resulted from the ACA disproportionately harm hospitals that care for patients receiving Social Security Disability. Yes, utilization is greater and readmissions are more frequent among patients who are sicker and poorer.